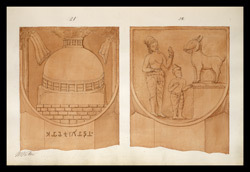 Wash drawing of two sculptured posts from the railing of the Mahabodhi Temple at Bodhgaya, Markham Kittoe (1808-1853), from an album of 44 drawings (24 folios) of sculpture on the stupa rail at Bodhgaya (Bihar), made by Kittoe during his investigation of the site, January 1847. Cover inscribed: 'Kittoe's Drawings. vol. 2. The Buddhagaya Rail.' Drawings inscribed: 'M. Kittoe. Capt. '; also with dates varying from 11 to 19 January 1847. The Mahabodhi Temple complex in Bodhgaya is one of the holiest sites related to the life of the Buddha as it is the place where he attained enlightenment. The present temple dates from the 7th Century with later additions, and was built on the site of a previous temple erected by Emperor Ashoka in the 3rd century BC. The temple consists of a central sanctuary with a tall pyramidal tower that is over 50 metres high and houses a large gilded image of the Buddha. The temple is built in front of the Bodhi Tree, the tree under which the Buddha obtained enlightenment, which is surrounded by a quadrangular stone railing that dates to the 2nd century BC. The railing was extended in later periods and the posts are either made of sandstone or coarse granite and are decorated with carved medallions with naturalistic and mythical animals, lotus designs and scenes from the life of Buddha, as can be seen in the two motifs depicted in this drawing.